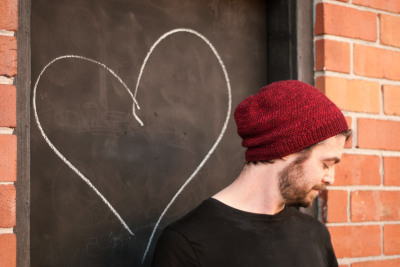 New pattern: Temescal hat | arlette knits. I love making hats. They don’t take much yarn, they’re great for using up scraps, I can knock one out in a day — and they’re as wearable as you can get. In winter, I keep a pile of them in a bowl and pick one out without looking as I head out the door. (I don’t really have to worry about matching my outfit, since I always seem to knit and dress in the same three or four colors.) I think in my whole knitting career, I’ve probably made about five scarves, three and a half pairs of mittens, maybe twenty pairs of mitts, two thirds of a glove, and dozens and dozens and dozens of hats. Lately I’ve been making even more than usual, for a damn good reason: they’ve been samples for a pattern I’m re-releasing today as Temescal, the first in a series of hats inspired by Oakland neighborhoods. I made four different versions of the hat and shot photos all over town, from way out by the cranes of West Oakland, to a vivid mural outside a pop-up poutine restaurant 40 blocks north. 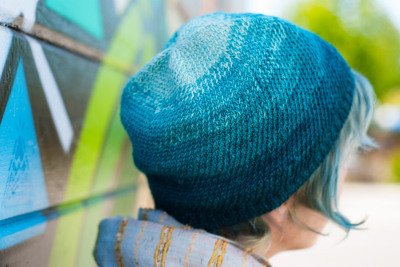 One version of the hat is really special, both for the stunning yarn and the way it fits my local theme: it’s made with a gradient set of mini skeins by Pigeonroof Studios, an indie dyer based in Emeryville, just north of Oakland. 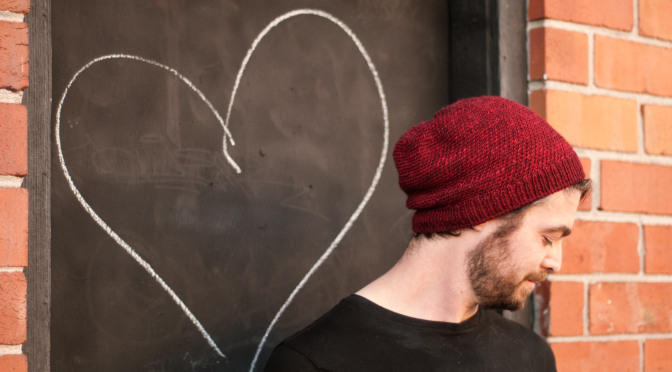 It can be hard knitting multiple samples of the same pattern, but I never got bored of knitting this hat. It’s knit on relatively big needles (seriously, I had to break out the size 13’s for the largest gauge, which I almost never use these days) and the stitch pattern has what I call a “popcorn” quality: easy enough I can do it on autopilot, interesting enough to stay hooked, and completely addictive. Each one had a different pattern, from all one color to a variety of stripes. Once I was done with one, I would start thinking right away about making the next. Anyway. It’s here, and I’m stoked. Check the pattern out on Ravelry or heck, buy it now!